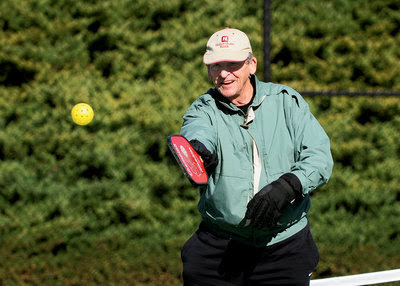 William Criswell, a Holly Springs resident, plays a game of pickleball with friends Friday morning at the east Cherokee home of Tom and Ann Earley. ﻿ “One of the things we do is have potlucks,” said Bill Hess, about his group’s game in the Lake Arrowhead neighborhood. “It’s even more of a social thing because people come around the table with their wine, and some of the wives will come and sit around. Then, eventually, they will come to a court and hit the ball back and forth.